dhtmlxPivot is a component that presents a client-side grid which is able to quickly analyze data from large datasets and render the result in a detailed but compact way. 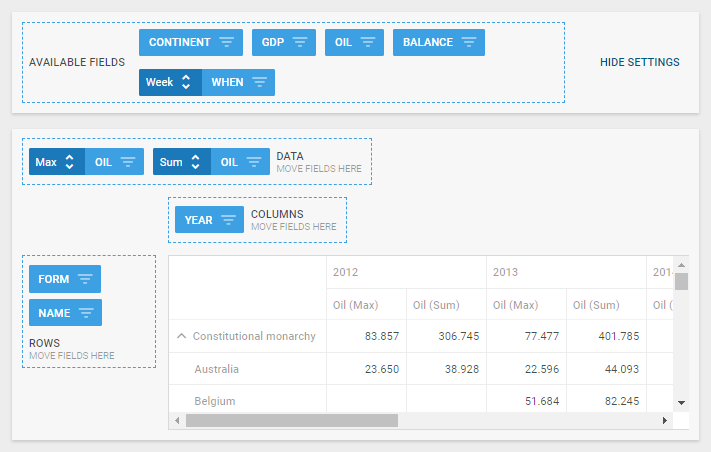 It lets compare and sort complex data within one table and easily adjust the scheme of data analysis. In this article you will explore the complex structure of DHTMLX Pivot for better understanding of its functionality. Elements (fields) presented in the above described sections correlate to data item properties from the dataset. You can set them to some of the sections initially or drag fields between sections to change the Pivot structure dynamically. The current data operations are specified next to the data values in the Data section. You can choose the neccessary operation by clicking a toggle next to the corresponding data field. To start working with dhtmlxPivot, follow the step-by-step How to Start tutorial.